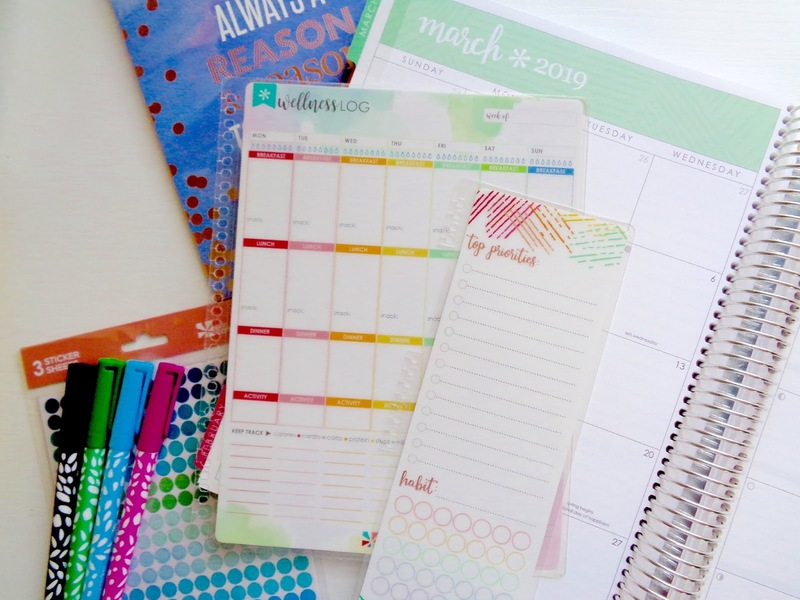 I can't believe it's already time to talk about midyear planners again! (whaaaat?) If you're a student, teacher, or maybe just someone who prefers to follow a more academic year, now is the time to start looking around for a new planner. I reviewed various midyear planners here on Being Heather last year, including the gorgeous and functional Erin Condren Life Planner, but this year I'll be reviewing and using a different Erin Condren planner. 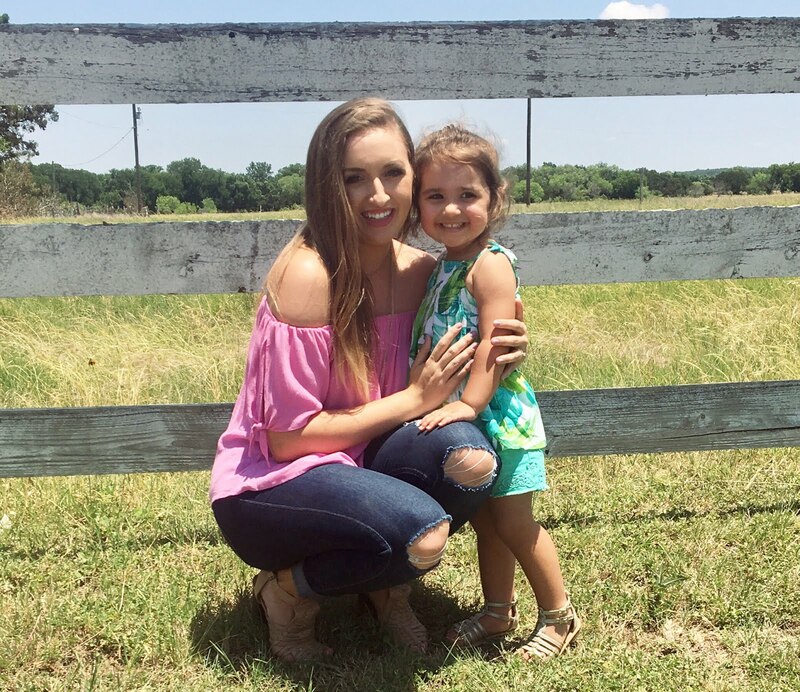 As some of you might know, I recently graduated with a degree in Interdisciplinary Studies, and will be (fingers crossed) an elementary teacher for this coming year. 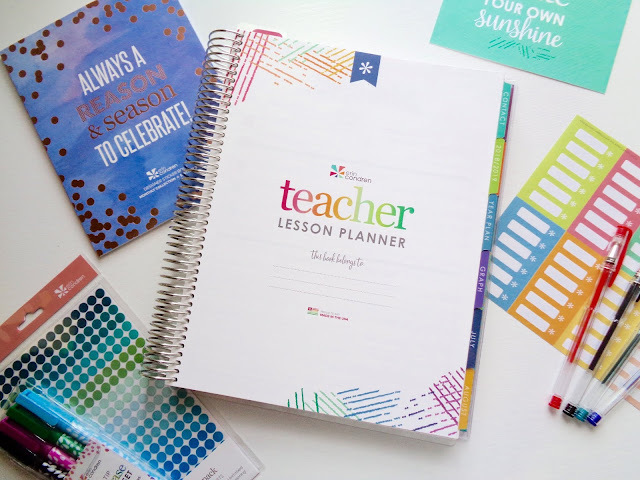 SO, since I'll be a teacher and my life will still be revolving around the academic year even though I'm not a student anymore, I decided to switch from the Life Planner to go with the Erin Condren Teacher Lesson Planner to cover both my professional and personal life. I'm so excited to move into it and put it to use starting in July! 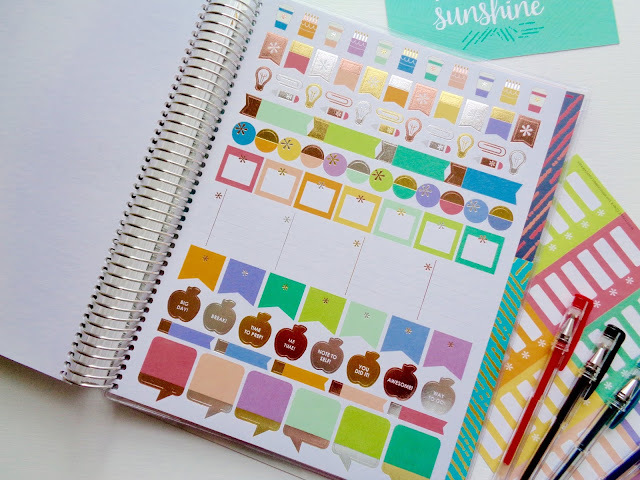 Y'all, as with all Erin Condren planners, this planner is of course absolutely beautiful AND functional. In this post, I'm going to walk you through this planner and tell you what I love (and maybe don't love) about each section, and why I think it's is the perfect planner for teachers. 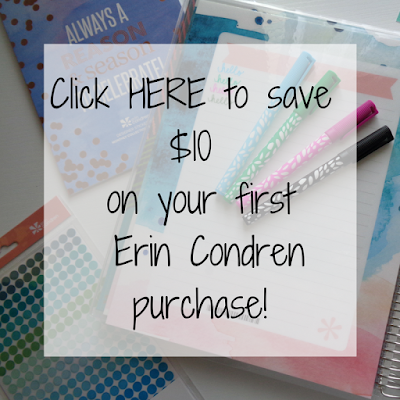 At the end I'll tell you how to get $10 OFF your first EC purchase! Fair warning- this will be a looooong post. 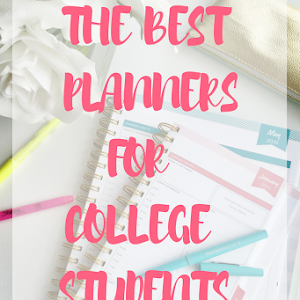 EC planners are an investment, so I want to make sure you have ALL the details. Let's get started! This is an 8.5x11 inch planner, so quite a bit larger than a Life Planner, which I LOVE. 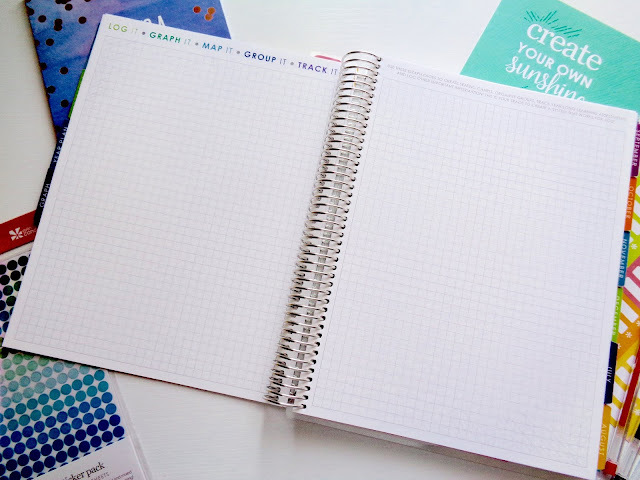 There is so much space to plan. EC planner covers are customizable, and can be taken on and off and switched out, so you can buy extra covers and change things up if you feel like it. 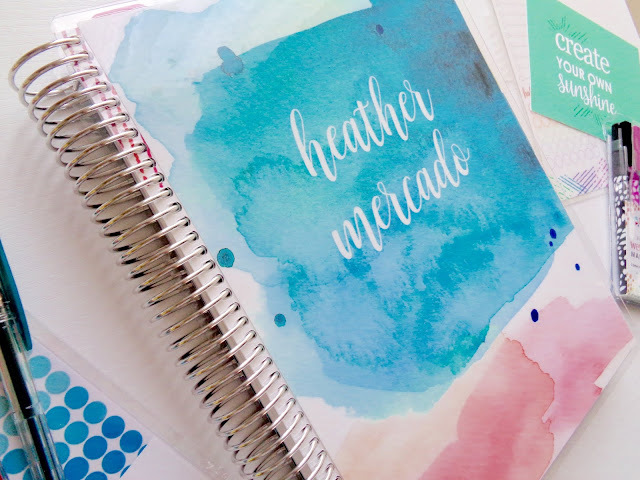 I went with the "watercolor splash" design to start off with this one. The front and back cover are made of thick, laminated plastic. It's super durable and protective. 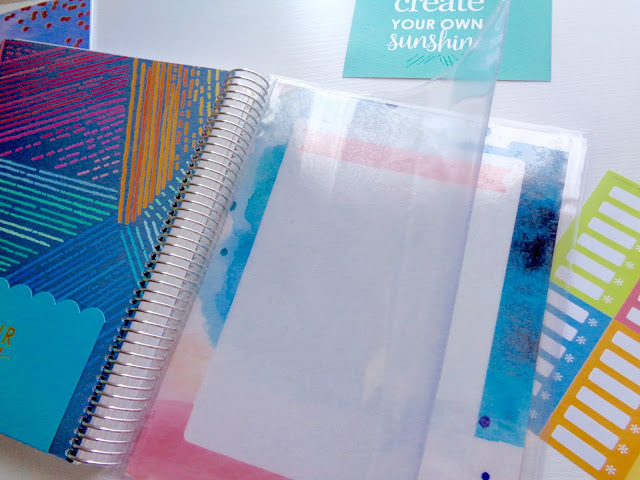 I love that the covers are interchangeable, so I can keep this cover and use it again if I want when it comes time to buy next year's teacher planner. Something else that's really cool is that the insides of the cover have a reusable lined area where you can write with a wet erase marker. (P.S how cute & pretty are these fine-tip wet erase markers from the EC store?! 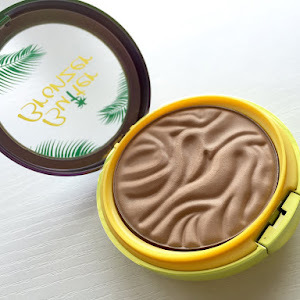 They only take a few seconds to dry and absolutely NO smudging!) 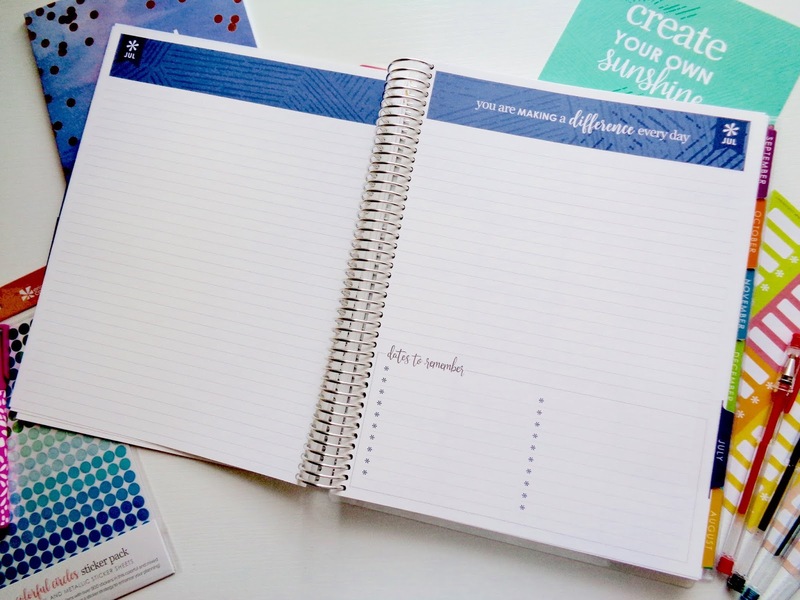 Just extra space for to-do lists, or any other sort of planning! 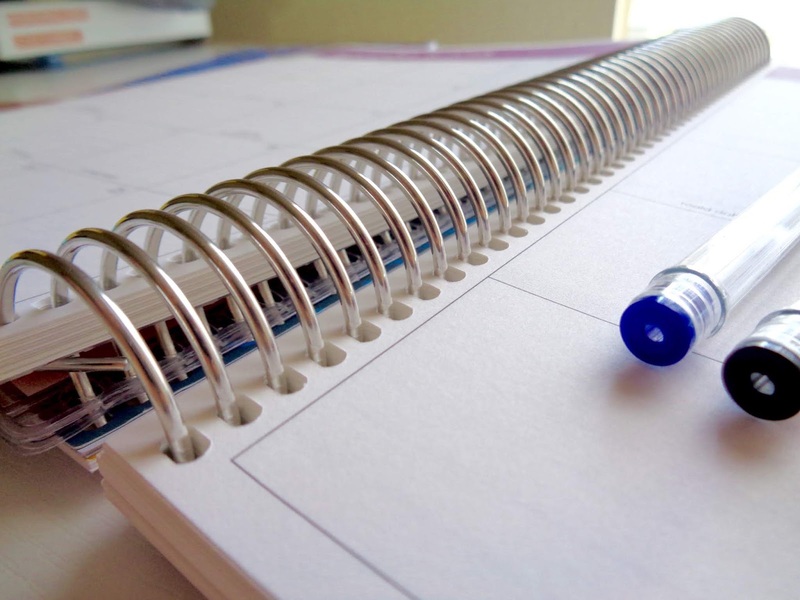 One thing I love about EC planners is the coil. In my opinion, the quality of the coil on EC planners is unparalleled. Most planners have a thin, cheaper coil that I've found can bend easily. EC coils are incredibly durable and well made. 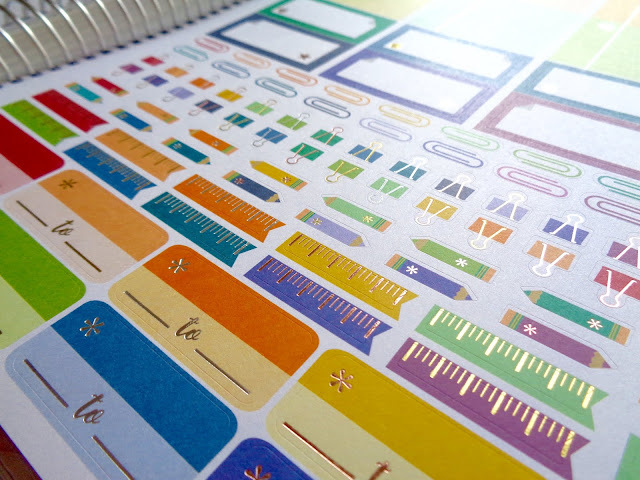 Coil quality is super important in a planner, it's what holds it all together! You can go with the standard platinum coil (what I went with for this year), or a rose gold coil, gold coil, or black coil for a little extra money. After the title page, the next page you come across in the teacher planner is the resource section. It has an "all about me" area where you can jot down basic info about your classroom and school, list important websites and other classroom resources, and a handy spot to log passwords. 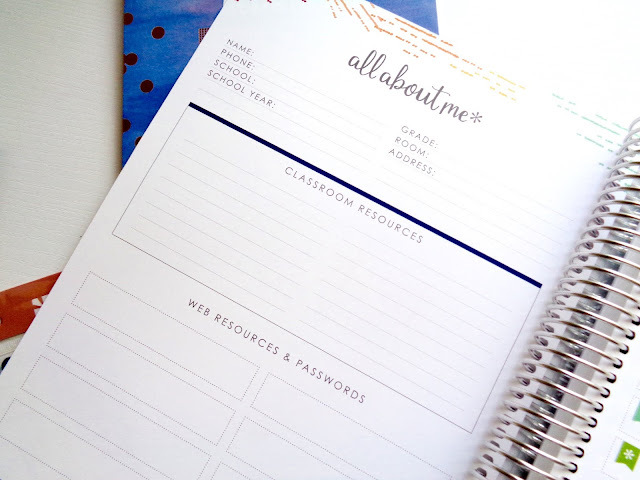 I really appreciate this addition, there are so many passwords for different apps and websites that teachers have to keep track of, and it's handy to have easy access to all the information you need right in your planner. 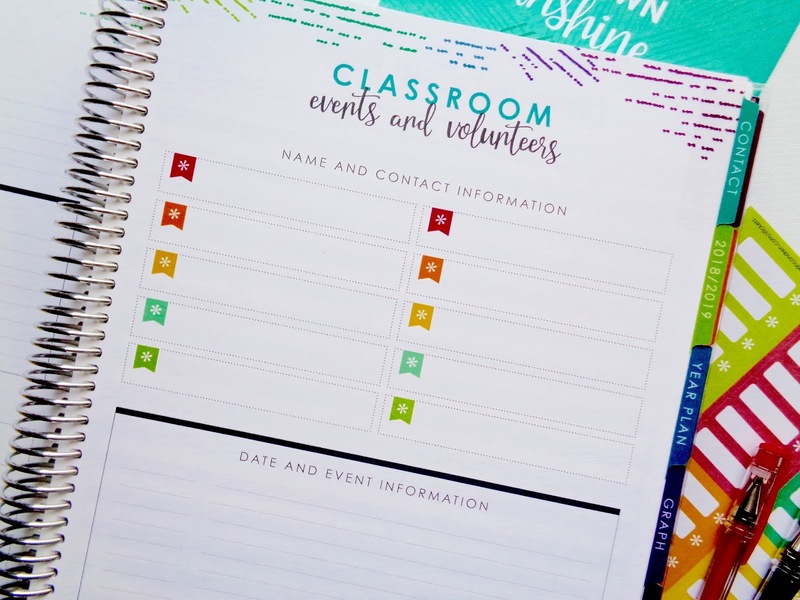 The second page in the resource section has an area for you to list name and contact information for classroom volunteers, as well as a section for you to note important events like field trips or assemblies. Another very thoughtful addition! This section is pretty self explanatory. 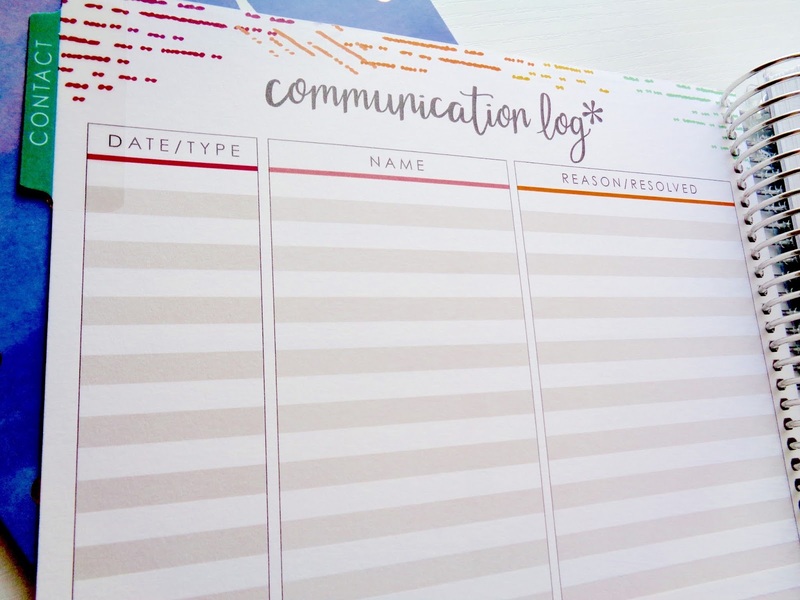 You can keep track of phone calls or even important emails with parents and other such people. I think you could even repurpose this section and use it for a reading log if you're a home school teacher, or something like that. 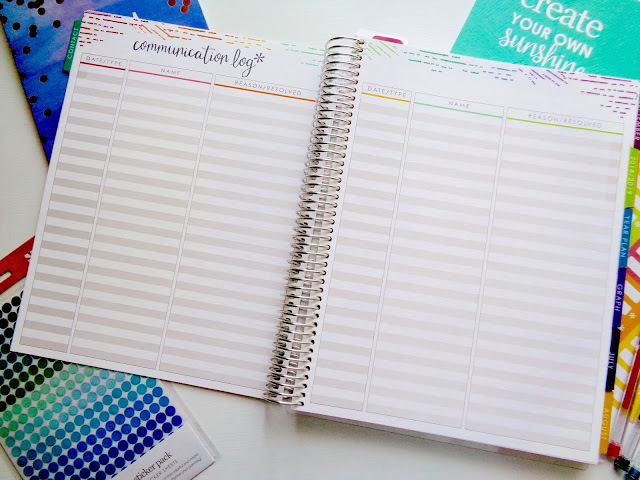 You can definitely change this planner up a little to make it work for your needs! This is a must-have section for me. 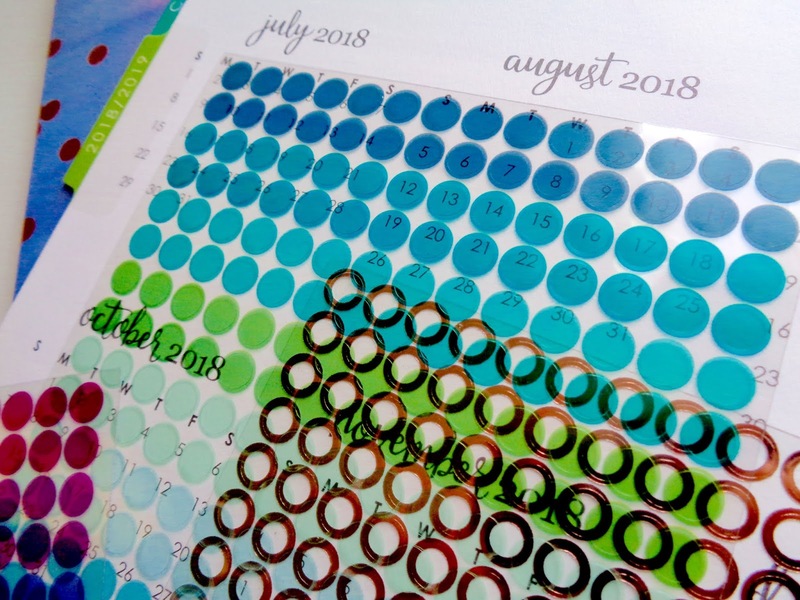 I love being able to see the entire year at a glance, and this yearly view goes from July 2018 all the way to December 2019. 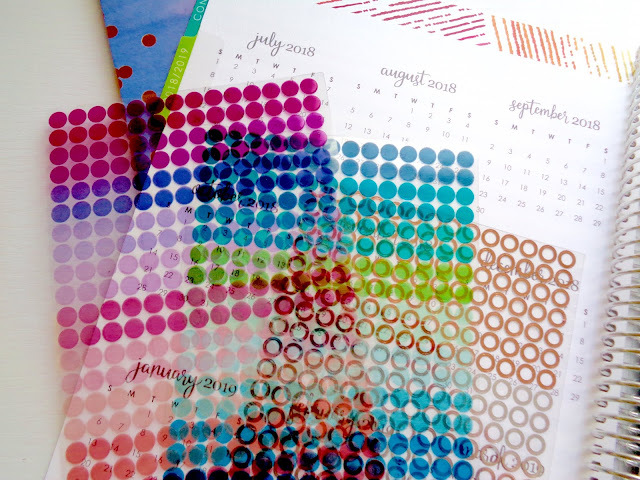 This year I bought these SUPER CUTE see-through dot stickers so I can color code important dates for things like birthdays, holidays, pay days, when bills are due, etc. I will create a little key for it at the top of the page and I'll be good to go! 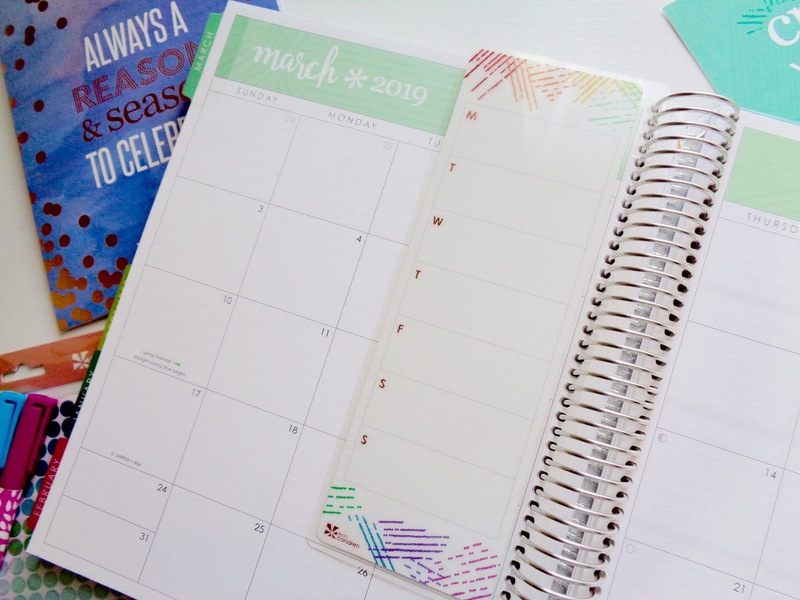 This two-page spread has a box for every month of the year. You can really use this however you want to! 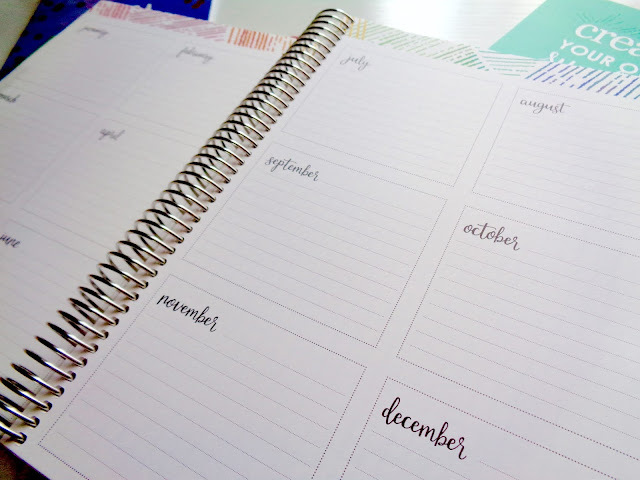 You can write down important things from each month you need to remember, your goals for each month, or maybe the units you will cover each month. 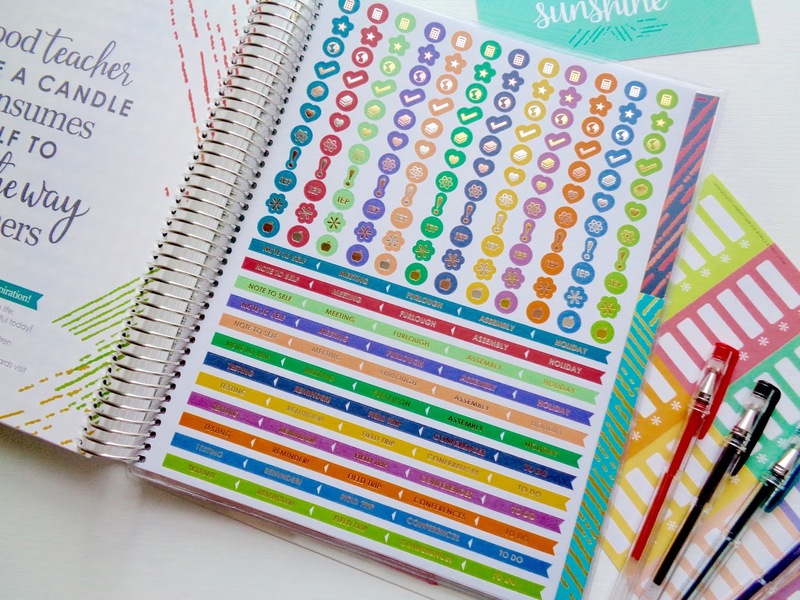 The possibilities are endless, and I love how this planner really allows you to make each section into what you want it to be. 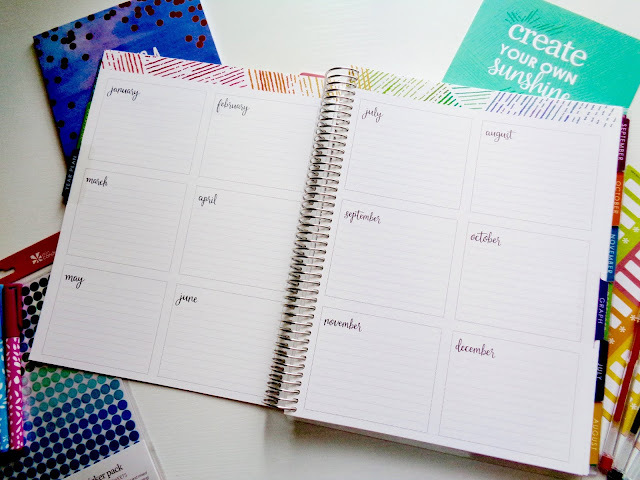 I haven't decided what I want to use this section for, but I like the idea of writing down the units I'll cover with my class each month, as well as a place to set monthly goals. And we have even MORE space to get creative with! 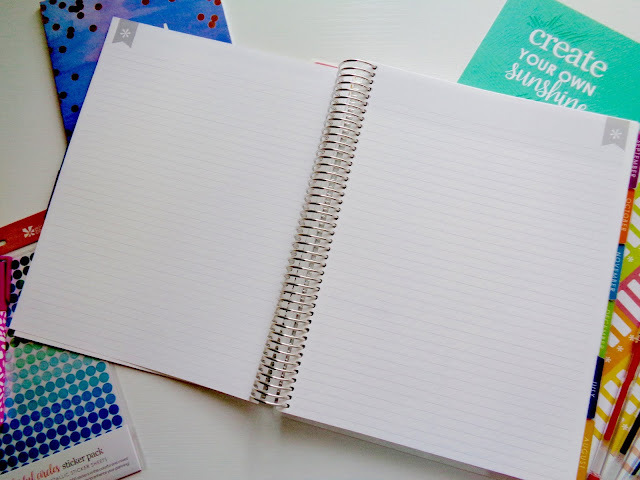 You get 4 blank graph pages, and 2 blank lined pages to do with what you wish. 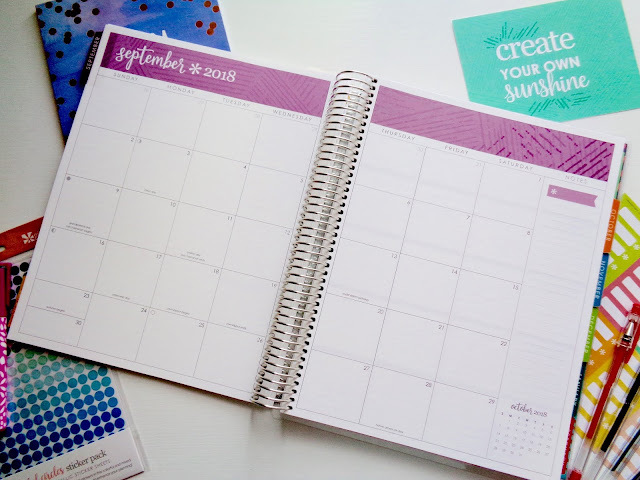 I've found lots of cute ideas on Pinterest on what to do with these pages, like a monthly task tracker, or a weight loss tracker. We'll see how I end up putting these to use! You get TWO WHOLE PAGES before every monthly layout. Once again, there is so much you can do with these pages, and can tailor it for your own needs. I love the addition of the quote at the top of the page, as well as the dates to remember section for a quick place to note important events. There is just so. much. room. 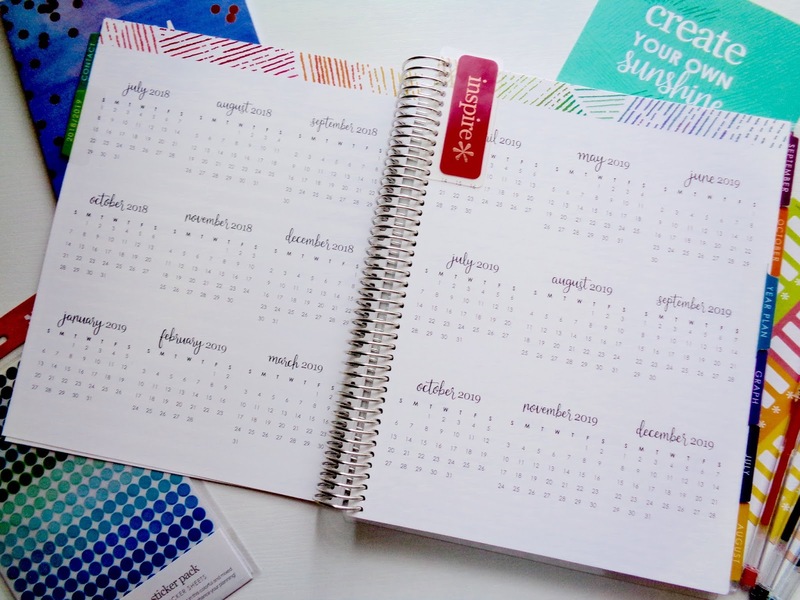 You also get two blank lined pages at the end of every month as well, after the weekly planning pages. 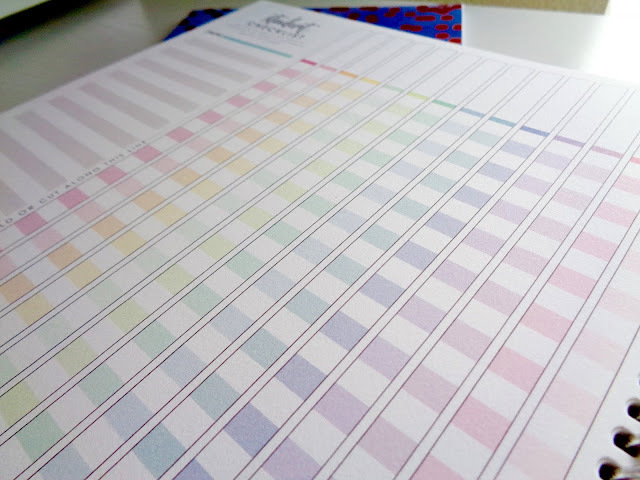 Alright, we're getting into what makes up the bulk of the planner now! 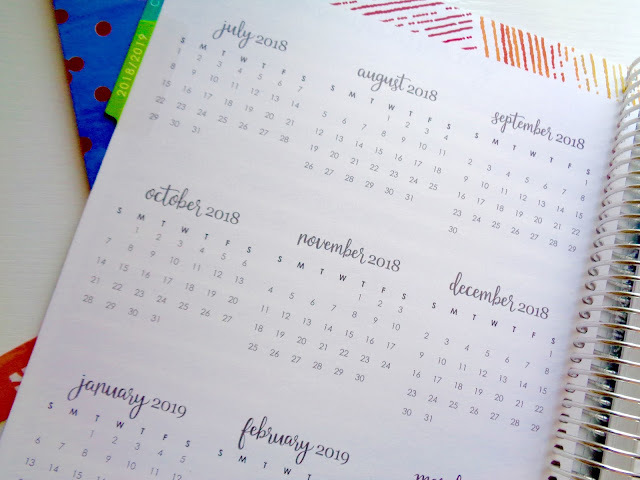 You get a large two page monthly view for each month of the year. 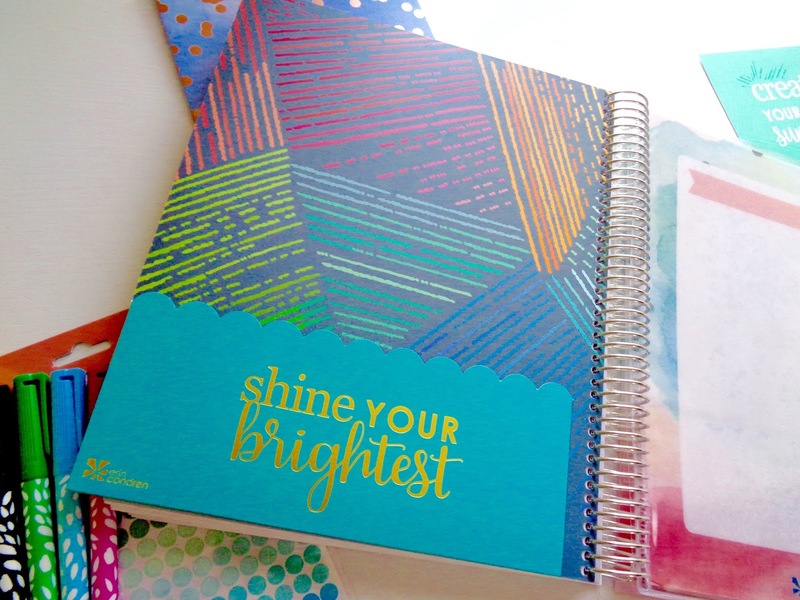 Because this planner is a larger planner, the boxes are huge! I'll definitely have PLENTY of room to write down important things for teaching as well as for my personal life. 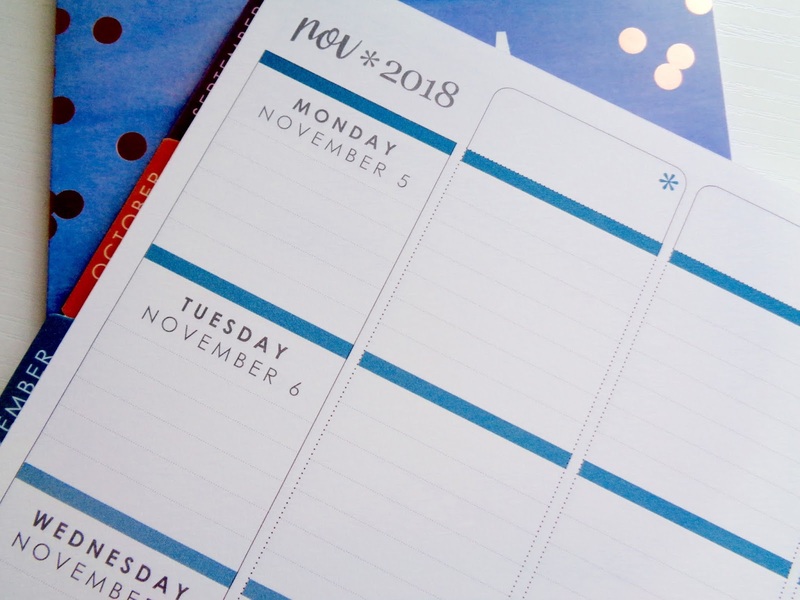 The little notes section on the side is great for writing down important things to get done each month, and the little sneak peak of the next month at the bottom of the page is also a helpful addition. 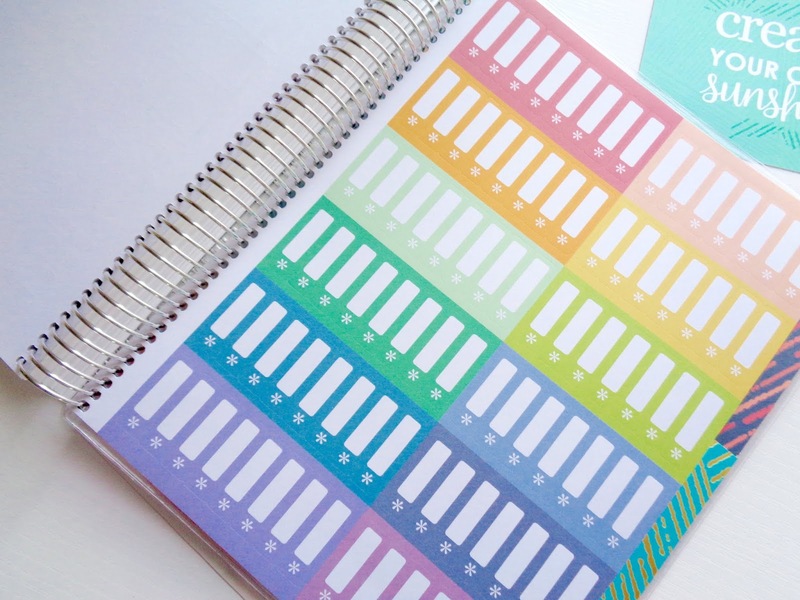 These pages are what makes up most of the planner of course. 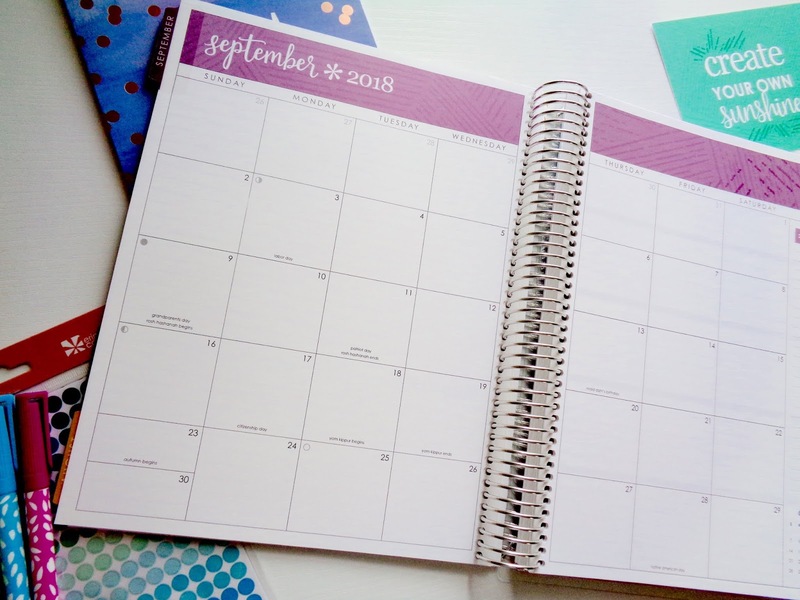 The weekly planning pages have the days, Monday-Friday, listed on the side, and then six unlabeled columns at the top, with the addition of a separate blank seventh column. I appreciate that the labels at the top are completely blank, so you can customize them as you wish. I love the clean look of the weekly planning pages, the fact that they're lined, and that the gorgeous gradient of color matches each month's color theme. My plan as of now would be to put the subjects I teach in the labels at the top, and then have one column or the separate blank column to jot daily things down for my personal life/ things for Saturday and Sunday. 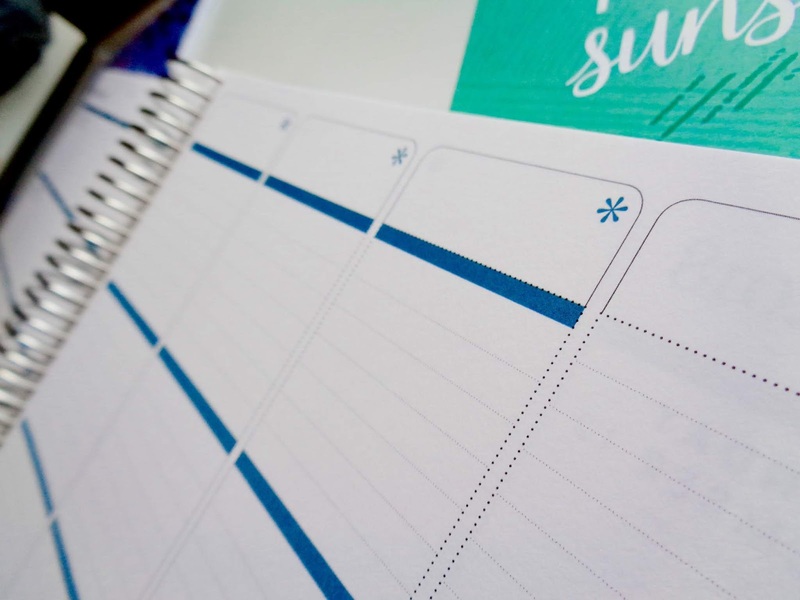 If I end up using electronic teaching plans more, I think I'll devote just one or two columns to teaching things, and then use the other sections for things like "work out," "home," "to-do" and other such things. I'm going to figure it out as I go and customize and change things as needed. 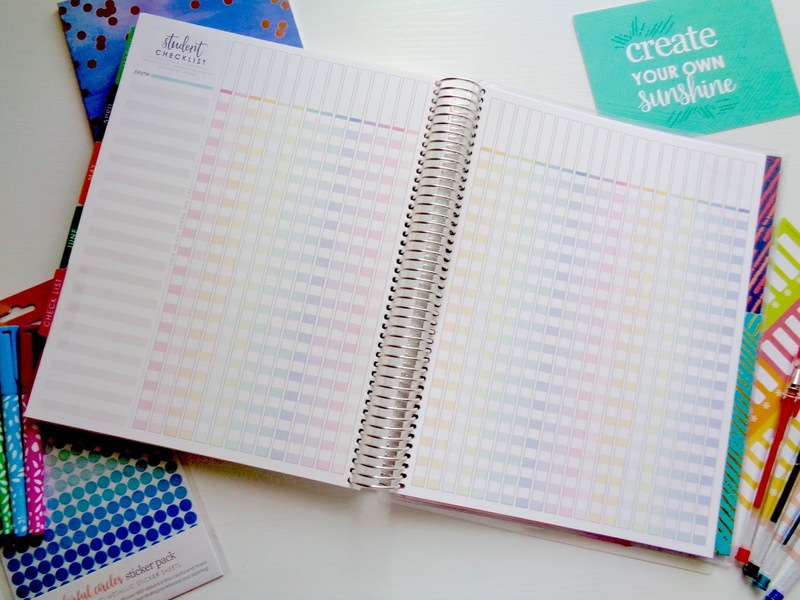 As someone who LOVES checklists and checking things off, I know these pages will definitely get good use! 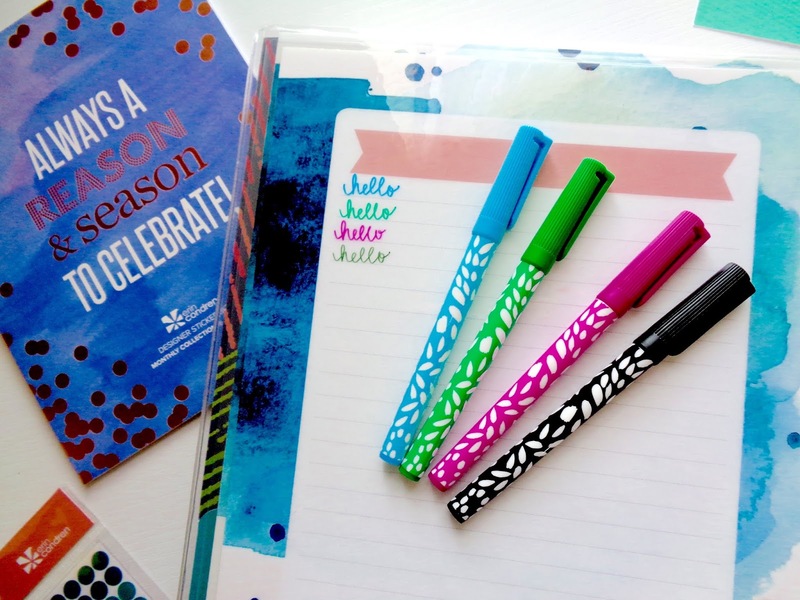 There are always things to make checklists for, from assignments to permission slips when you're a teacher. 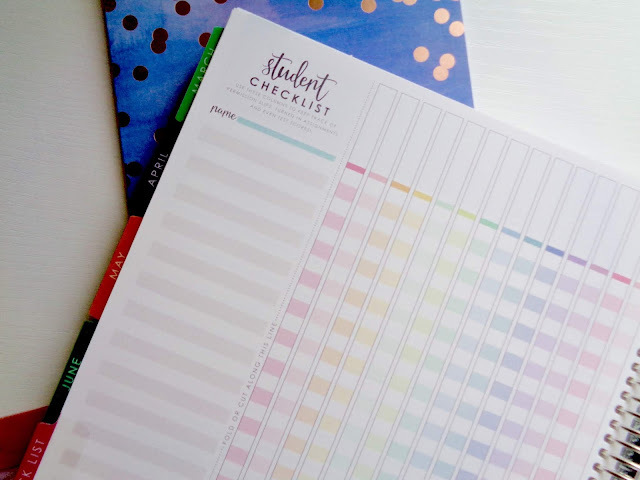 I love how functional and colorful these checklists are! 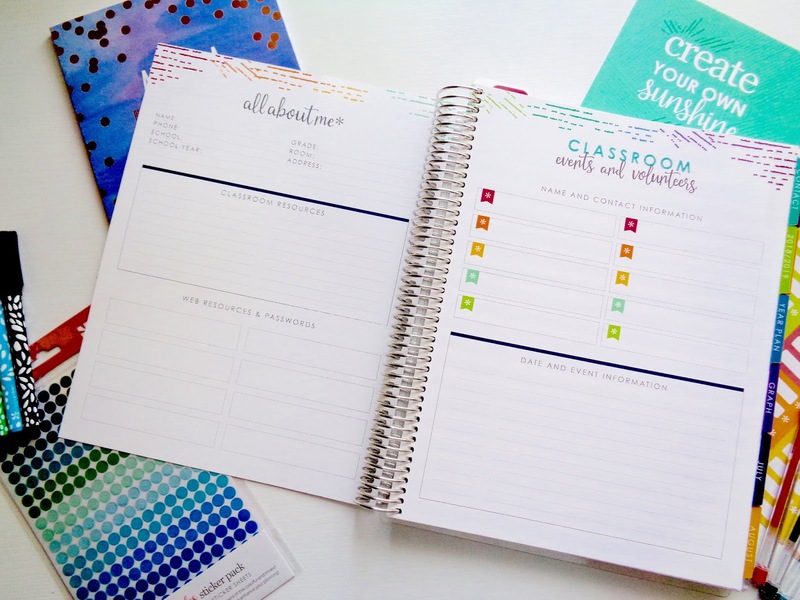 A standard teacher planner comes with 7 pages of checklists, but you can choose to add in extra checklists for an additional cost. I love how EC planners come with free stickers coiled in at the back, and the teacher planner is no exception! 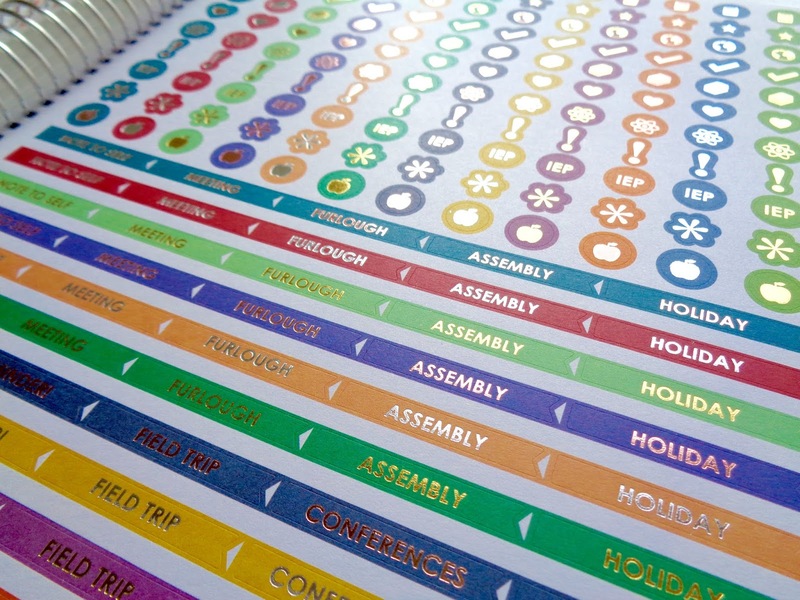 You get FOUR sheets of beautiful stickers to start you off with. If you want more, EC has tons of options online. 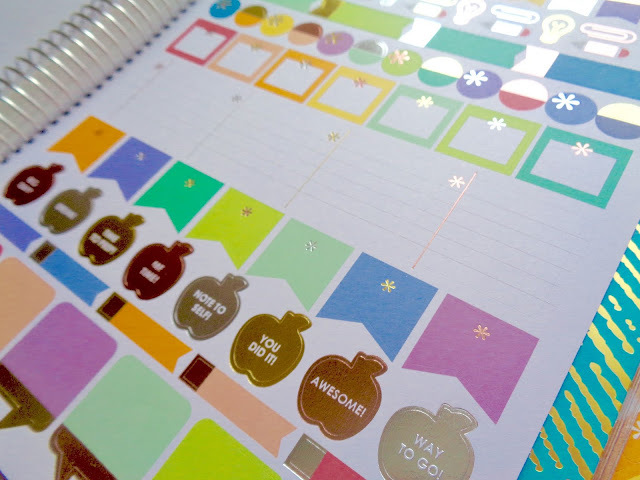 I bought the 2018 monthly sticker book which has a sheet of stickers customized for every month (the sheet for October from the sticker book is pictured below), as well as an extra sheet of event flag stickers. EC also released a ton of other cute teacher-themed accessories, like the ones you can get in this starter pack! 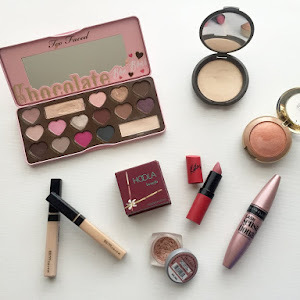 I have a lot of stuff on my own wish list. Last but certainly not least, the EC Teacher Planner comes standard with one coiled in sheet protector, and a super cute coiled in double sided folder. I paid an extra $1.50 to get an extra sheet protector put in, and you can put in up to 3 sheet protectors in total. 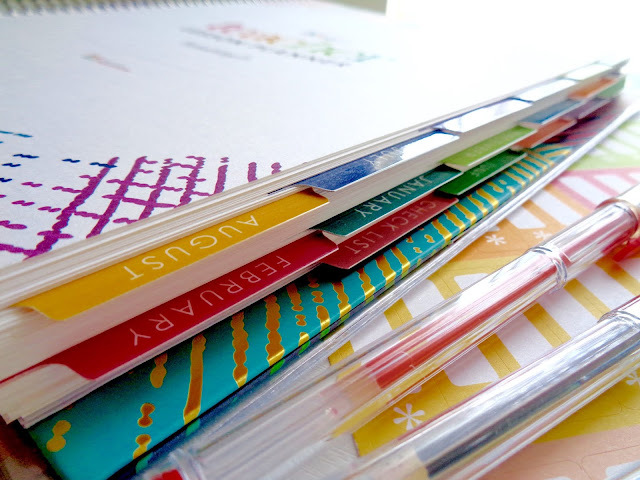 They will be super helpful to keep important documents at hand so I can access them quickly. They're not your standard, thin sheet protectors either, they're super thick and feel very durable. 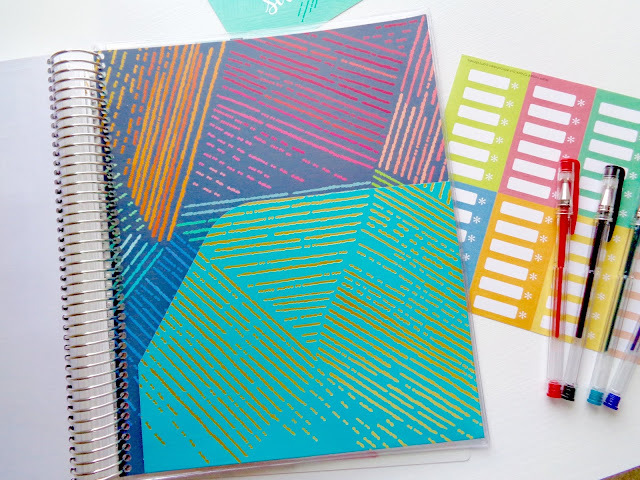 The double sided folder pocket is beautiful! I love the colors and the metallic detailing. One side fits up to a standard size of paper, and the one on the back side is a little smaller. I think I will use the smaller pocket to keep extra stickers in! That's it for the planner walk through! Now for my final thoughts. 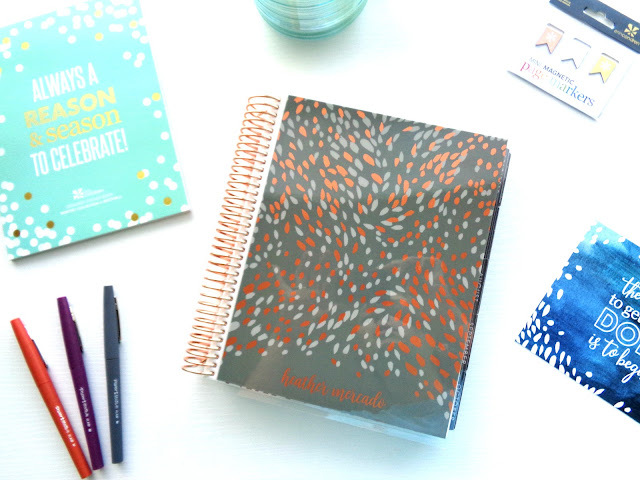 Yes, these planners start out at $55 and yes that is expensive. However, I truly think that they are completely worth the investment. I remember reading somewhere that the cost breaks down to about $4.50 a month, and that that's the price of one Starbucks coffee. 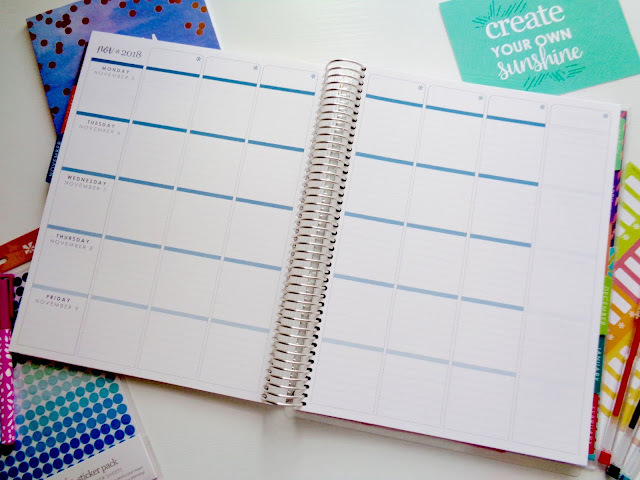 I would happily give up one Starbucks coffee a month to have a great quality planner. Reading that really put things into perspective for me! Planning and keeping my life organized is a priority for me. 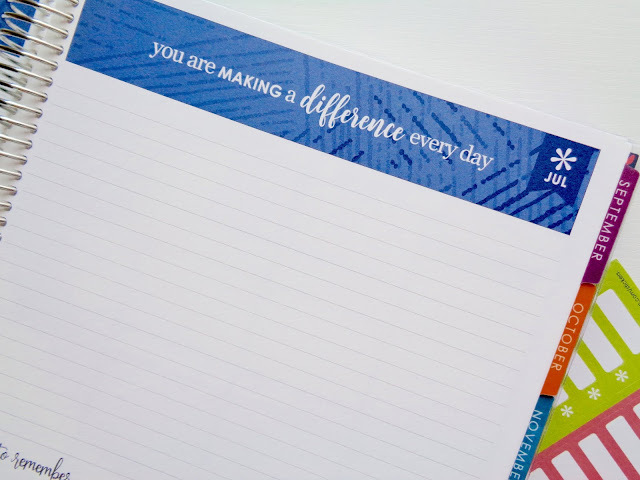 The PAPER: The EC teacher planner has heavy duty cardstock-like paper. 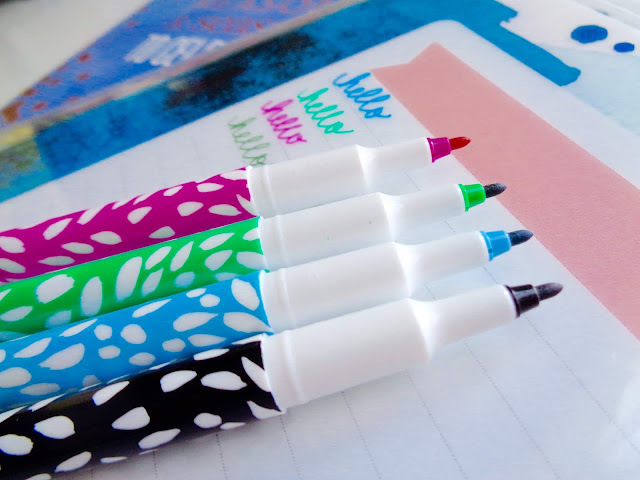 You don't have to worry about your pens bleeding through, and it makes the planner feel very well made. The COIL: I already talked about this, but it's so important. 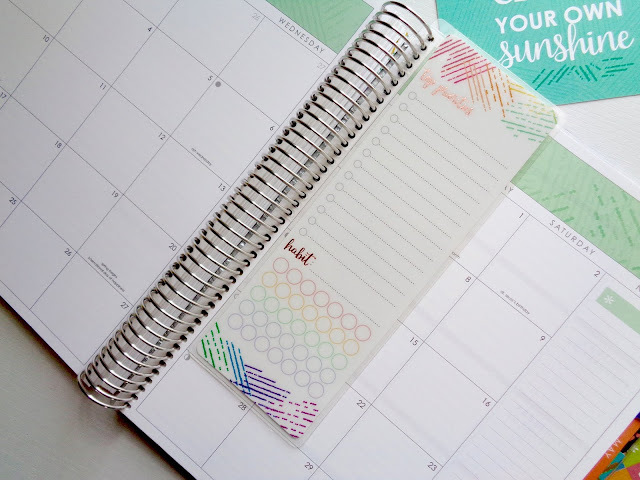 A good quality coil ensures that your planner will last through your busy, chaotic year. CUSTOMIZATIONS: EC planners are so customizable, and this one really leaves room for you to make it your own and make it work for your life. 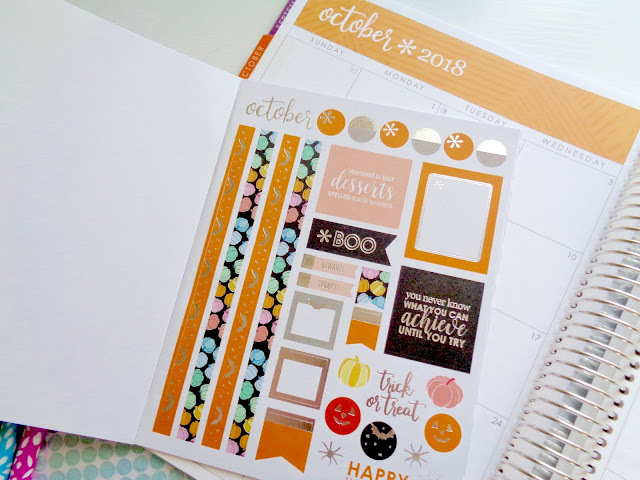 STICKERS: I am definitely a sticker gal when it comes to bringing some excitement and pretty detail into my planning, so I love that the planner comes with free stickers in it already. Room for NOTES: There are so many places dedicated for notes and creativity! 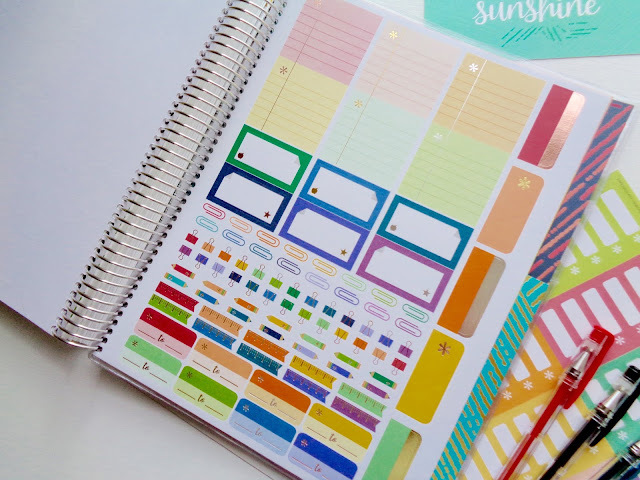 Snap in ACCESSORIES: You can buy so many snap in accessories for this planner, like these snap in bookmarks, snap in to-do list dashboard, snap in wellness tracker, and so much more. 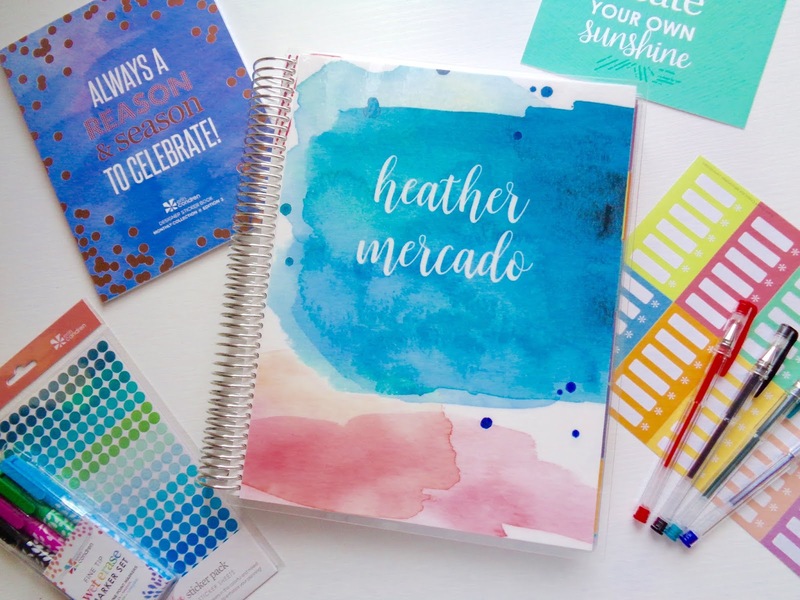 If you like what you see and are interested in this planner or in other EC planners, click here or on the picture below to get a $10 off coupon to use on your first EC purchase! All you have to do is create an account and your coupon will be emailed to you! 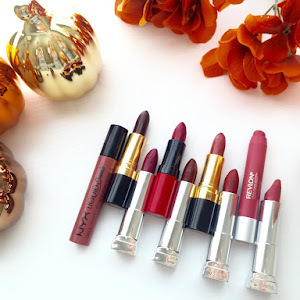 If you're not a new EC customer and still want $10 off, sign up for an account with the link as well using a different email address and make another account. That's it for this post! 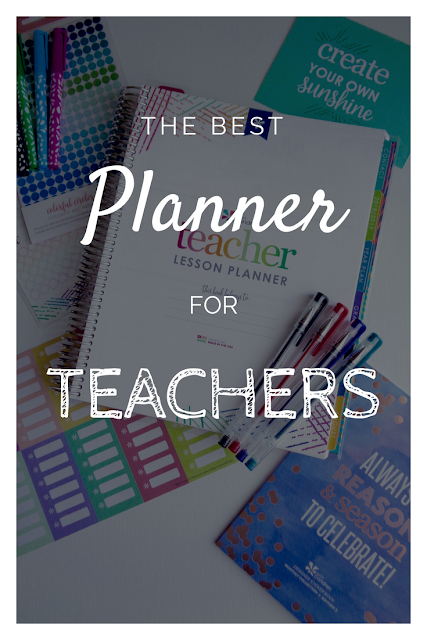 I hope you found it helpful, and that if you do order an EC teacher planner, that you love it as much as I love mine! Comment below with what you're most excited about in the new EC teacher planner, and what you liked about them in the past years! Thank you so much! Glad you enjoyed.